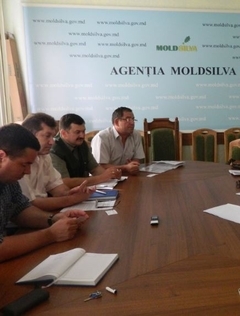 The National Program Advisory Committee (NPAC) in Moldova is chaired by Agency Moldsilva (www.moldsilva.gov.md), central public authority for forestry and hunting in the country. Moldsilva has recently reconfirmed the FLEG Focal Point and reapproved Regulations of NPAC functioning as well as nominated its membership. NPAC includes representatives of Ministry of Environment, Agency Moldsilva, NGO community, local public authorities, private forest owners and representatives of donor and implementing organizations. The 1st meeting of NPAC for the ENPI FLEG phase 2 was organized on June 20th in Chisinau. The NPAC approved the Country Work Plan (CWP), which is mainly focused on community forestry development, creating more opportunities at local level, promoting energy forestry, cooperation between governmental forest bodies and other forest owners, improving transparency and supporting professional education of young generation. The “Strategic Environment and Social Assessment Framework” (SESAF) was approved by NPAC too. The main scope of the SESAF document is to ensure all draft of Policy, Program and Plan (PPP) documents that are going to be prepared within the ENPI FLEG Program will integrate environmental and social aspects under the operational policy of the World Bank. The Resolution (in English and Romanian) of the NPAC meeting can be downloaded below.